... the 1.08 is the units conversion constant, which allows us to multiply a flow rate with units of cubic feet per minute by a temperature difference in °F and come up with Btu's per hour. The problem is that the units conversion constant in this case includes a density term (that's part of how we convert cubic feet per minute to pounds per hour), and a specific heat term (that's how we convert a temperature difference into a quantity of energy per pound of air). And, as you can see from the chart above, both of those metrics vary with temperature. In other words, units conversion constants are not always constant. If you are interested in how the 1.08 in the equation above is derived and the impact changes in the properties of air can have on it, that is discussed in a post on our blog titled Unit Conversion Constants; Not Always Constant. 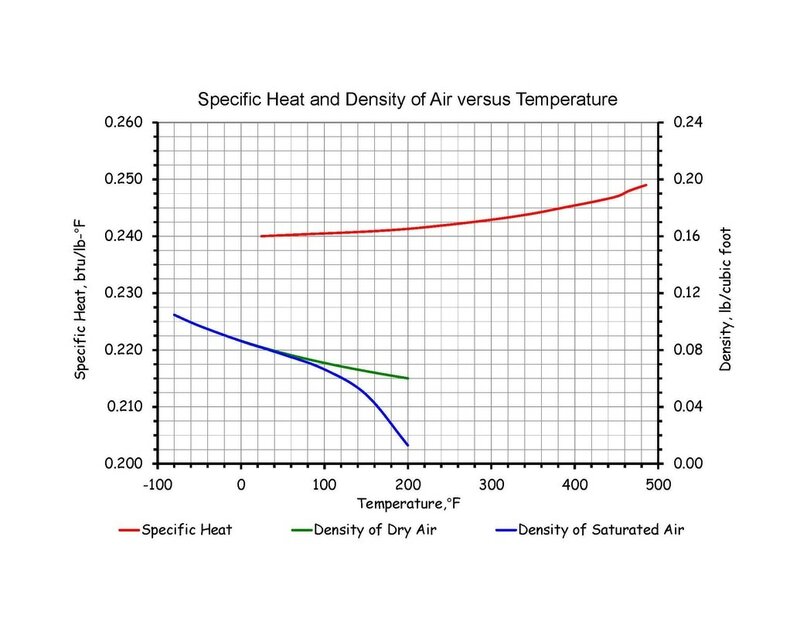 The point here is that the constant isn't constant and for air, most of the time, the factor that impacts the units conversion constant the most in HVAC applications is the variation in density with altitude. Obviously, as you can see from the graph, temperature impacts the density of air, especially moist air, even at a constant altitude. But the impact at the temperatures typically seen in HVAC systems is less significant than the impact of altitude. ​Note that when you download the spreadsheet, you will need to strip out the descriptive name and parenthesis around the file name to get it to run properly on some systems. For instance, for this file, you would need to eliminate the parenthesis and the words Air Density Correction with Altitude Spreadsheet from the file name. You can also change the file name to something that works better for you if you want as long as you keep the .xlsx file extension.